You’ve probably heard about the recent incident in which an uniformed & uneducated about breastfeeding waitress called the police on a mother who was drinking & breastfeeding. The waitress reported that the mother was consuming “drink after drink” & “even took a drink WHILE breastfeeding the baby” GASP! The mother maintains that she only had two drinks. News flash lady….our mouths don’t act as a funnel leading straight to the breast. So really, since it takes a little while for the tiny amount that is actually passed through the milk, the mom was doing the best thing, since by the next feeding the alcohol would be gone! Anyway, the mama was arrested for child endangerment & the waitress was fired. I’m glad the waitress lost her job. She was completely out of line. 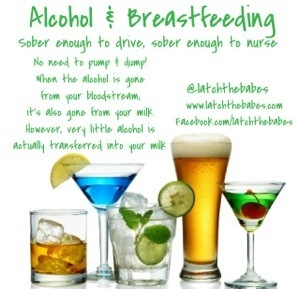 So in light of that, and because it’s the Eve of New Years Eve, here are some facts about consuming alcohol & breastfeeding! If you are sober enough to drive, you are sober enough to nurse! Alcohol doesn’t go into the milk and just live there forever. As it exits your bloodstream, it also exits your milk. First I took a sample of my milk (about 1 mL) prior to drinking any alcoholic beverage. I expressed the milk mid-nursing session to ensure I had a goodly portion of fore & hind milk. After completing the nursing session, I mixed myself an alcoholic beverage consisting of 2 oz of 80 proof (40%) vodka in 10 oz of soda (Sprite). I proceeded to drink the entire 12 oz in about 30 minutes. About 30 minutes after finishing (1 hour after beginning to drink), I expressed some milk (about 1 mL) and labeled it ‘immediate’. I then waited 1 hour and expressed more milk (about 1 mL) and labeled it ‘2 hours’. In the 2 hours (from the beginning), I did not drink any more alcoholic beverages, drink other beverages, or eat any other foods. Another day, 1/2 of a beer (4.3% alcohol) and 2-6 oz glasses of wine were consumed within 1.5 hours. About an hour from the beginning of the last drink, a milk sample (about 1 mL) was taken. This sample was labeled ‘1 hour – 3 drinks’. Another sample was taken about an hour after that (2 hours after the beginning of the last drink). This sample was labeled ‘2 hours – 3 drinks’. The samples were stored in the refrigerator until processing. An Agilent headspace instrument was used to run the tests. Propanol and ethanol standards were also tested to ensure the instrument was within limits. The instrument is maintained by the KSP Lab Toxicology Section and used in forensic determinations of blood and urine alcohol content. The sample labeled as ‘immediate’ registered as 0.1370 mg/mL which correlates to 0.01370% alcohol in the sample. The sample labeled ‘2 hours’ registered as 0.0000 mg/ml which correlates to 0.0000%. The sample labeled ‘1 hour – 3 drinks’ registered as 0.3749 mg/mL which correlates to 0.03749% alcohol in the sample. The sample labeled ‘2 hours – 3 drinks’ registered as 0.0629 mg/mL which correlates to 0.00629% alcohol in the sample. The alcohol content in breast milk immediately after drinking is equivalent to a 0.0274 proof beverage. That’s like mixing 1 oz of 80 proof vodka (one shot) with 2919 oz of mixer . By the way, 2919 oz is over 70 liters. Two hours after drinking one (strong) drink the alcohol has disappeared from the sample. Completely harmless to the nursing infant. Drinking about 3 drinks in 1.5 hours resulted in higher numbers, but still negligible amounts of alcohol would be transferred to the child. One hour after imbibing in 3 drinks, the milk was the equivalent of 0.07498 proof beverage. That would be like adding 1 oz of 80 proof vodka (one shot) to 1066 oz of mixer (1066 oz is over 26 liters). Two hours after imbibing in 3 drinks, the milk was 0.01258 proof. That would be like adding 1 oz of 80 proof vodka to 3179 oz of mixer (over almost 80 liters). So, even though an infant has much less body weight, any of these percentage of alcohol in breast milk is unlikely to adversely affect the baby. Bottoms up! So, from this we see that very little alcohol is passed to the baby. Consume right after a feeding (or even during) so that by the next feeding, the alcohol will be gone from your milk. If you plan to consume several drinks, plan ahead and pump a bottle or two & resume breastfeeding when you feel sober again. NEVER share your bed with your baby while intoxicated!